Fremont Street Experience will soon be home to a new attraction, Fear the Walking Dead Survival, scheduled to open summer 2017. Inspired by the hit AMC series, thrill-seekers and zombie fanatics will enjoy this unique multisensory experience that combines a thrill ride, escape room, maze, and interactive gaming, all set against the horrors of a zombie apocalypse. The attraction, in the heart of Fremont Street Experience, is in partnership with TRIOTECH, a Canadian company who is a leader in creating high profile, technologically-advanced interactive media-based award-winning attractions. “Fremont Street Experience is always looking to create the optimum experience for our guests, including tourists and locals alike. Among our many other attractions and events such as SlotZilla and the Downtown Rocks summer concert series, this new attraction will not only benefit downtown Las Vegas, but the city as a destination,” said Fremont Street Experience CEO and President, Patrick Hughes. “We’re excited to partner with TRIOTECH, a leader in creating innovative and immersive attractions in the entertainment sector along with AMC®, which is home to some of the top rated, most critically acclaimed, fan-favorite programs on television. The groundbreaking attraction will feature elaborate sets, all-encompassing audio and video, as well as high-tech motion simulator technology. Upon entering into the “Fear the Walking Dead Survival” experience, guests will find themselves in the setting of a temporary military facility set inside a junior college amidst growing rumors of a zombie outbreak. Brave souls will have to explore the inner-workings of the military-controlled facility, which includes multiple zones and various experiences, to face their fears and protect their lives against a bloodthirsty hoard of the infected. Visitors will need to utilize their survival skills and instincts to fight off the never-ending zombies to hopefully escape back into the real world. 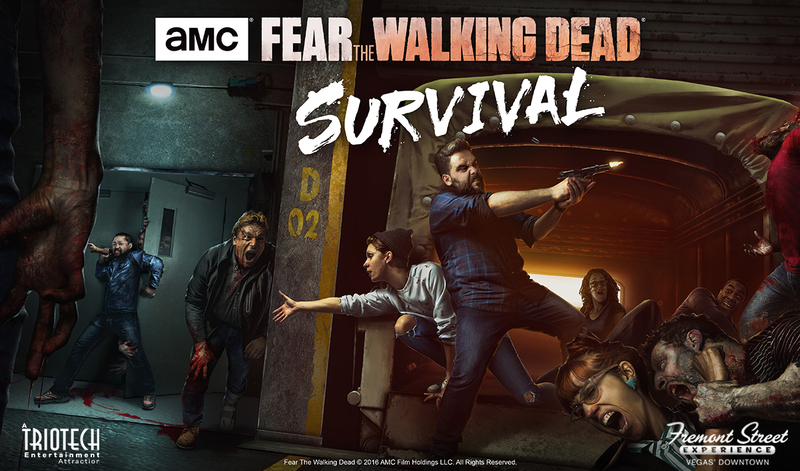 Fans of the cult-following TV series, “Fear the Walking Dead™,” will immediately recognize many of the attraction’s features, but even those unfamiliar with the AMC® show,” will love the fright-filled, exhilarating attraction – only available at Fremont Street Experience. AMC’s “Fear the Walking Dead” is the second highest rated drama on cable TV and the fourth highest rated on cable overall in 2017.